Hello, I’m Victoria, and I’ve been given the awesome opportunity to be the first guest post-er on Mr. Davis’s blog. I’m so excited. I’ve known him for a while, and I love his books and writing tips so I’m honored to offer a few tips of my own. Thank you, sir! Characters are the center of our stories. In the end, it all revolves around them. We want our precious mind children to be deep and realistic, but sometimes the stubborn buggers won’t just tell us on their own even while we’re writing the stories. Here are seven ways to coax them to spill their lives to you. 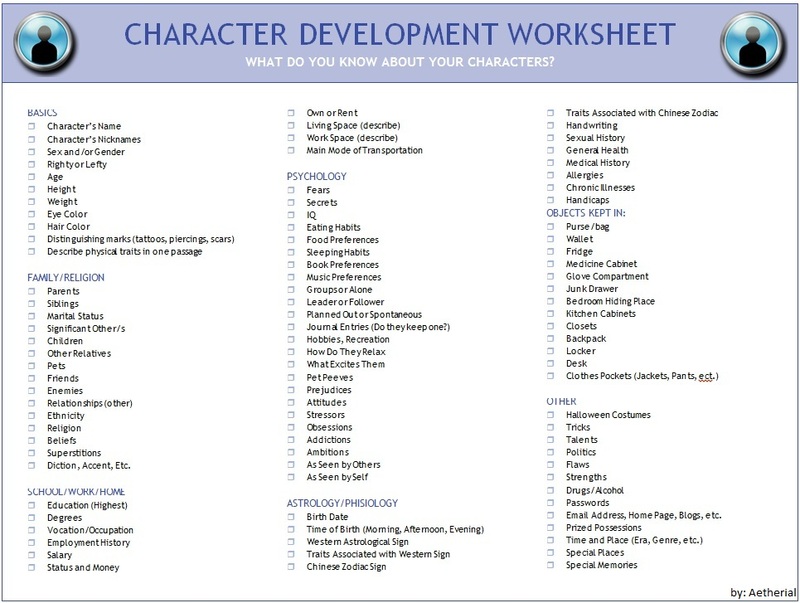 Character Worksheets – This is probably the most common method writers use to develop characters. Worksheets can be found pre-made like this one, or you can create your own. They commonly have blanks to fill in about your character’s appearance, personality, and lifestyle. Some handy things I’ve learned to specifically include are characters’ internal and external goals, what lies about themselves or the world they believe, and what about them needs to be changed. Talking with a Brainstorm Buddy – A writer always needs one or more of these to bounce ideas off of. It can be a relative, a friend, or whoever. It’s handy to have a brainstorm buddy to come up with ideas and/or ask you questions. I’ve found it most effective if they just ask you random questions about your character, and you have to answer. It gets the brain juices flowing. Character journaling – I have not tried this method, but I’ve known people who find this very effective. Basically, you write a journal as if you are that character. It is a form of role-playing. This can help you get into the mindset of the character thus the ideas can come. I’ve heard this used primarily with characters who don’t get any parts of the book in his or her point of view. Pinterest or Picture Collecting – This can really help with the visual side of your character. Finding pictures on Pinterest or just the web (with caution) of people who look like the character or the character’s clothing or objects they own can help ideas flow for description. It’s handy to make a Pinterest board of your character or your book to store the pictures in an organized place. If you don’t have Pinterest and/or don’t want it, you can just put them together in a file on your computer. Character Interviews – This method works the best if you have a blog. First post a short bio of your character prompting your readers to ask your character questions. Then a week or two later after gathering all the questions answer them as your character. Using this method allows you to get a lot of questions from a lot of people. Often you’ll receive questions you or your brainstorm buddy would have never thought of otherwise. For examples you can check out my bio and interview with my character Mor. Drawing Your Characters – If you duel as an artist and a writer like I do (Some of my artwork is displayed in the main image above), this is the way for you. Unlike finding just random pictures, you can draw your character exactly as you picture them. This also helps you tap into the visual aspect of your characters. By studying their appearance and their expressions straight from your head into the corporeal world, you can learn much about who they are. Seeing something physically can be the jolt you need. Character Chatting – This is my all-time favorite way to develop my characters. I’ve been doing this for years now, and it has helped immeasurably. This takes role-playing to an extreme as you chat via Facebook, Yahoo, Gmail, or any other chat room as your character with friends. Doing this allows you to get deep into the head of your character in real time as you have to be them among other people as opposed to just yourself. I explain this in more detail in a post on my own blog. If you’re a young writer (high school through college) and you’d like to try it out and you don’t have any writerly friends to do it with, you can ask to join this character chat group I’m a part of. 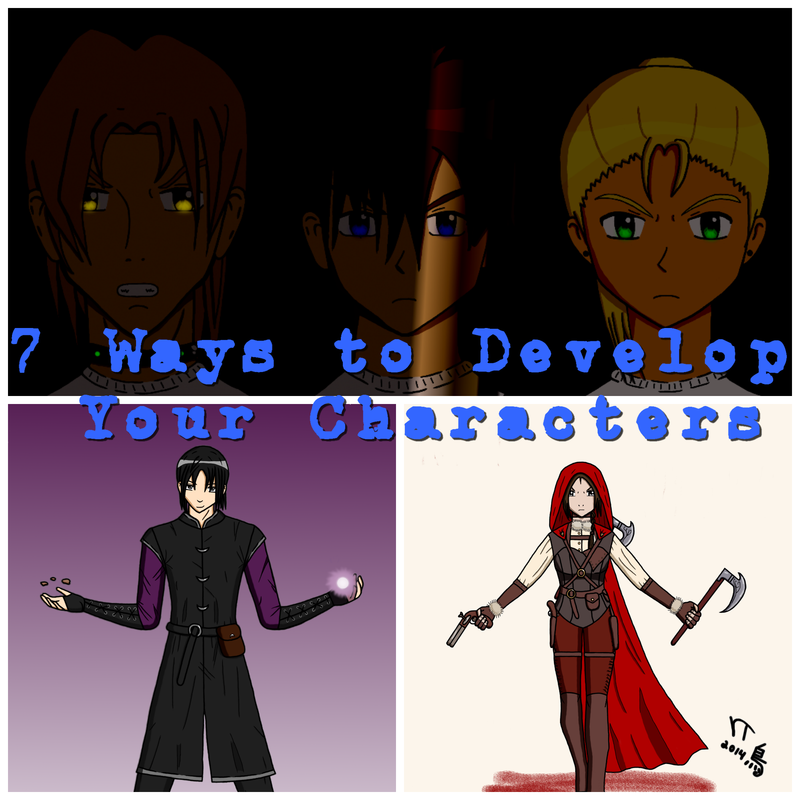 I hope one or more of these seven methods help you get to the heart of your characters. Trust me, eventually they do talk. Happy writing! May the muse be ever in your favor! I’m interested in trying the first and last methods. Awesome. ^ ^ I hope they help. I have used all of these methods, though I did not do character journaling for very long. Oh really? Cool. 🙂 Which one did you find was the most useful? I use the first and second and fourth methods in abundance. I have one friend, a fellow writer, who I always talk with about stories and new ideas and characters. We both use what we call profiles. Writing out for every character thing likes name, age, gender, hair color, height &weight, bio, and personality. Some profiles are shorter than others. But fair warning to you all about searching for pictures. It can take awhile to find pictures of the image you have in your head and takes quite a bit of work. Looking for pictures is also a great way get ideas. It is really fun for me. I am interested to try some of these other ideas. Thanks for sharing Victoria Grace. Oh cool! It does take a while to look for pictures, but it can be fun. 🙂 No problem. I’m glad you enjoyed it. What if you have no one interested in being a “brainstorm buddy”? I have been slowly brainstorming and developing a story world and a story line, but there is no one i see on a regular basis that is willing to help. Which one of these methods might work best for a solo writer to try? I have tried 1 and 4, and I am definitely going to try 5 and 7 in the future! Thanks for the tips! A blog reader created this amazing and extensive character profile form writers can use for their characters – http://www.daviscrossing.com/character-profile-form.docx Check it out.